It is quite common for someone to know that they are unhappy with their current kitchen, but not be able to come up with a remodeling plan for their new one. If you are in this situation, it is important to look for different ideas wherever you can find them. You’ll be able to become inspired by the great ideas that other people have had, and even use them to come up with your own incredible features that will make your kitchen beautiful and unique. If your home is set up in such a way where your kitchen leads into a dining or living room, consider making the whole area much more open and easier to navigate. Whether you have to have a wall knocked out, or you just need to move things around, the open floorspace will be well worth the effort. In many cases, opening up the area will make both rooms seem larger. It also makes it so you can use extra space for the kitchen when necessary, but then also have the extra space for the other room at other times. This is a very flexible remodeling idea that many people love. Another trendy option is to have a long kitchen island that doubles as a table. Going this route allows you to ensure your counters are functional at all times rather than just when used for cooking. You can choose to make this your main dining area, or if you have a full dining area, you can use the kitchen island just for a convenient breakfast location or something else based on your own needs. Of course, having a great table option like this is also perfect when entertaining. You can use the kitchen island to put all the food for serving, then the actual eating can take place in the formal dining room. 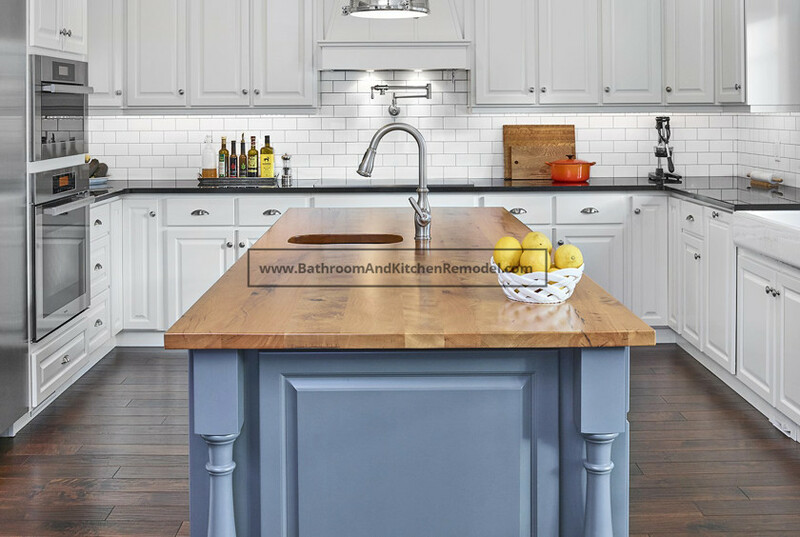 However you decide to use it, a large kitchen island is a great option to consider for your remodeling project. When people think about kitchen appliances, they often picture either black, white, or stainless steel. A growing trend, however, uses appliances with bold colors. Whether it is a stove with a dark blue front and top, a red refrigerator, or a green dishwasher, these items will really make your entire kitchen stand out. This also allows you to choose whether you want to get all your appliances the same bold color, or choose complimenting colors for each one. If you are still looking for more remodeling ideas, consider talking to one of our professionals. We have helped hundreds of people from throughout Long Island, Nassau County, and Suffolk Country. Working with these clients shows us some incredible ideas that you may love. We can also answer your questions about what is feasible, and how much it might cost you. To get in touch with one of our kitchen design professionals, please give us a call at (631)-836-7579.